Nevadans consume about twice the national average of several prescription painkillers, making us among the most narcotic-addled populations in the United States, a Sun analysis has found. Explore drug use nationwide. See how frequently individual flights were delayed to and from McCarran International Airport in 2007. 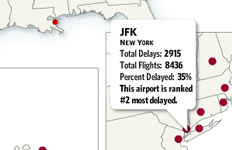 Also: Read "Delays of the Land," an overview of the most-delayed flights. Jun. 9, 2008 A life-size cutout of a Sudanese girl sits inside a real U.N. Refugee Agency tent used to illustrate the conditions in which refugee families live for the exhibit “Torn From Home: My Life as a Refugee” at the Lied Discovery Children’s Museum in Las Vegas. Jun. 4, 2008 "Double Negative", Michael Heizer's first prominent earthwork, on the eastern edge of Mormon Mesa northwest of Overton. May 14, 2008A look around Las Vegas’ most intriguing art gallery. Mar. 2, 2008 A view from the infield at the Las Vegas Motor Speedway during the UAW-Dodge 400. Feb. 19, 2008 The Neon Museum has spent $1.4 million to cut apart, move, then rebuild the cement and glass lobby designed by architect Paul Revere Williams. The project was a challenge unlike any other. Nov. 15, 2007 Immerse yourself in a 360-degree audio-visual panorama of the “Spin Room” at the Nov. 15 Democratic presidential debate at UNLV in Las Vegas. See Dennis Kucinich and actor Matthew Modine in this multimedia-surround sound view.